Conditions much improved today. Snowed quite a bit. 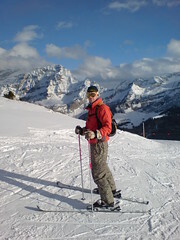 Gryon was a bit rubbish but Villars was pretty good. Wendy did pretty well today too. Hopefully more snow overnight. Leg work at the gym was a good idea. Thighs feel fine but should have done calves too as they kill a bit.